Too many people focus on brushing their teeth and forget about their gums and their tongue. Plaque builds up, not just on your teeth, but on and around the gum line, where both the teeth and gums are vulnerable to infection. Bacteria also likes to collect on the gums and the tongue, causing bad breath, in addition to possibilities for infection and disease. Food gets stuck between your teeth, where your toothbrush can’t reach. If you let it sit there, it will rot between your teeth, attracting nasty bacteria and leading to tooth decay and gum disease. So don’t forget to floss at least once a day. Various types of mouthwashes are available in both over the counter and prescription forms, depending on your needs. Most over-the-counter mouthwashes can help reduce plaque, gingivitis, and kill the bad bacteria that cause tooth decay and bad breath. 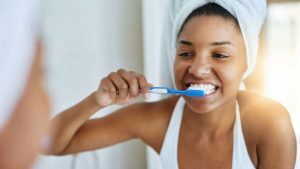 If you do use mouthwash, check for one that has the American Dental Association (ADA) label, because that shows the manufacturer has been able to demonstrate both the safety and efficacy of their product. My personal favorite is Smart Mouth, a rinse that is powered by Zinc. (Note: children under 6 years of age should not use mouthwash because they are likely to accidentally swallow large amounts of the liquid). Sugar does a number of bad things for your mouth. Not only does it erode tooth enamel, it also feeds the bad bacteria that live in your mouth. Like anything else, your mouth is a delicate microsystem and anything that interferes with that system can have nasty, long-term effects. As they say in sports, sometimes the best offense is a good defense, and that’s as true of your mouth as it is of football. By eating leafy greens with plenty of calcium and vitamin K, you’re making sure your body has the building blocks it needs to build strong teeth and bones. When your teeth are strong and healthy, it’s harder for germs and bacteria to get through your body’s natural defenses. Chewing on hard objects, such as ice, can damage the teeth by creating tiny cracks in the enamel, which create openings for germs and bacteria to enter the teeth and cause decay. You may think your teeth look fine after you’ve been munching on a few ice cubes, but that’s only because the damage isn’t visible. The truth is that, even if you can’t see it, you’re doing microscopic damage to your teeth that could have major consequences later on down the line – letting in bad bacteria that can eventually lead to bad breath, gum disease, cavities, and even root canals. So stop chewing ice and popcorn kernels, stop drinking soda and swap out those harmful foods for the more beneficial vegetables, especially leafy greens. Meanwhile, keep flossing, using mouthwash, and as always, brushing your teeth – and your gums and tongue.